The U.S. Practical Shooting Association (USPSA) has announced the dates of its 2010 National Championships. Divided into four events, the Nationals are expected to draw more than 1,000 top shooters competing in a variety of divisions. 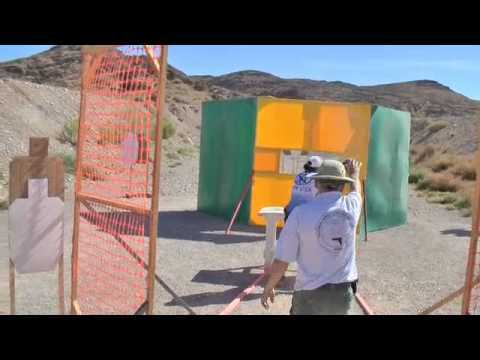 Featured in the video below are “Women of USPSA” (including Team Glock’s Jessie Abbate) shooting at the 2009 USPSA Nationals. Be sure to watch this great video. Some very talented ladies demonstrate amazing shooting skills. The first event on the calendar, the USPSA Single Stack Nationals, will take place April 28 through May 1 at the PASA Park ranges in Barry, Ill. In 2009 this event drew 270-plus devotees of the venerable 1911 pistol. Next on the schedule is USPSA’s MultiGun Nationals which will take place in Las Vegas, Nev. at the Desert Sportsman’s Rifle & Pistol Club ranges September 9 through 12. The MultiGun championship draws close to 150 shooters using pistol, rifle and shotgun in the Open, Tactical, Limited and Heavy Metal divisions. The USPSA championship season will wrap up with back-to-back handgun championships also held in Las Vegas from October 8 through 16, 2010. With over 600 shooters participating, the USPSA back-to-back handgun championships represent the largest gathering of Practical Shooting competitors in the USA. In addition to America’s top guns, the match will also draw some of the best shooters from South America, Europe and the Pacific Rim. To learn more about the USPSA National Championships and other major matches on the 2010 schedule, visit www.uspsa.org or call (360) 855-2245. Share the post "USPSA Championship Dates Set for 2010"
Grizzly Industrial, makers of gunsmith lathes and other products, offers a Digital Tailstock Readout Kit for just $149.95. This digital readout (DRO), model T10118, is an affordable, helpful tool for shooters who do their own lathe work, and who need a fast, handy way to measure depth of cut with their tailstock. On the www.Grizzly.com website, you’ll find a full description of the Digital Tailstock Readout, complete with photos and product features. The unit is very versatile. It has two (2) digital readouts. One on the unit itself, PLUS a remote display that can be positioned up to 6 feet away. Both displays feature 0.0005″ resolution, inch or millimeter display, zero keys and ON/OFF keys. The scale has an 8-inch range and its display features ABS or INC mode as well as a Hold key. Both displays read independently of each other. What I find most helpful using this Grizzly Digital Tailstock Readout is the way it enhances the speed and certainty of multi-step processes. For instance, when preparing to bore a deep hole by first stepping through various bit diameters to get close, you are unlocking and moving the tailstock to change bits. The Grizzly DRO lets you lock down with a new bit in the chuck, hit zero as the leading edge of the flutes align with the face of the bore. As you are backing each bit all the way out to clear chips, the DRO lets you fast return without counting handwheel revolutions to within a hundredth, then slow down to begin the cut. This is very helpful in keeping track of what’s going on, and it’s a good backup for fine control (comparing the last few thousandths with your tailstock’s manual dial). I have a dial indicator set-up for fine work off the tailstock, but opted for this DRO instead because of its greater range and equal accuracy. As the digital transducer is sensitive to contamination by liquids, you’ll need to be careful about splash from your cutting fluid sources. I used a simple stationary spring clip to hold a plastic sandwich bag over the face to catch any splash during chamber reaming using high pressure through-the-barrel flushing. The plastic was easy to see through with the eye, but the camera wanted to catch light glare and not show the on-tool digital display well. You can mount the remote readout wherever it is convenient, but I wanted my vision focused only in the working area for this operation. For the value, I would rate this tool as a “must have” for anyone currently working without a DRO on their lathe tailstock. The Grizzly DRO is simple to set up, easy to operate, and has an ample 8″ range. Durability is unknown at this time as I’ve just started using the unit, but hopes are high. Like all your other electronic tools, keep an extra set of batteries on hand. Also, please note — to keep the price down and make the Grizzly DRO fit anyone’s particular tailstock quill diameter, Grizzly correctly judged that if you were in the market for this tool you will be able to build your own quill adapter. Share the post "Gunsmithing Gear: Grizzly Digital Tailstock Readout"